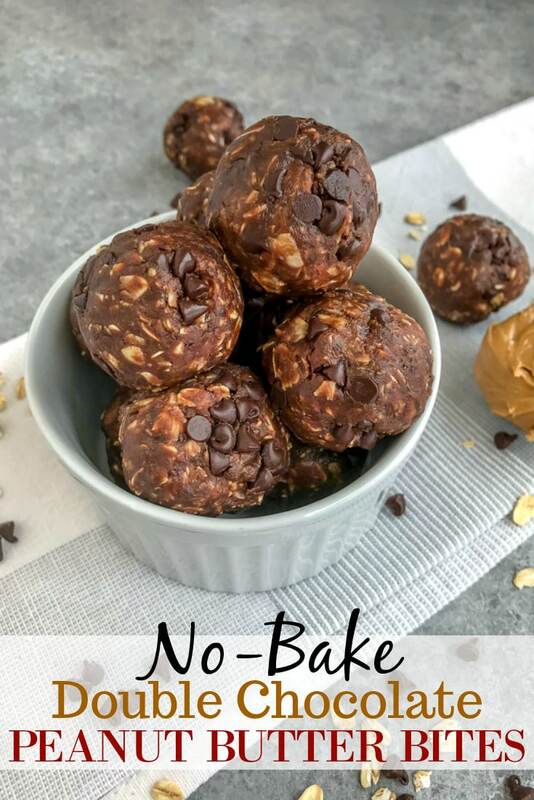 These No-Bake Double Chocolate Peanut Butter Bites are unbelievably easy and quick to make while being unbelievably delicious! 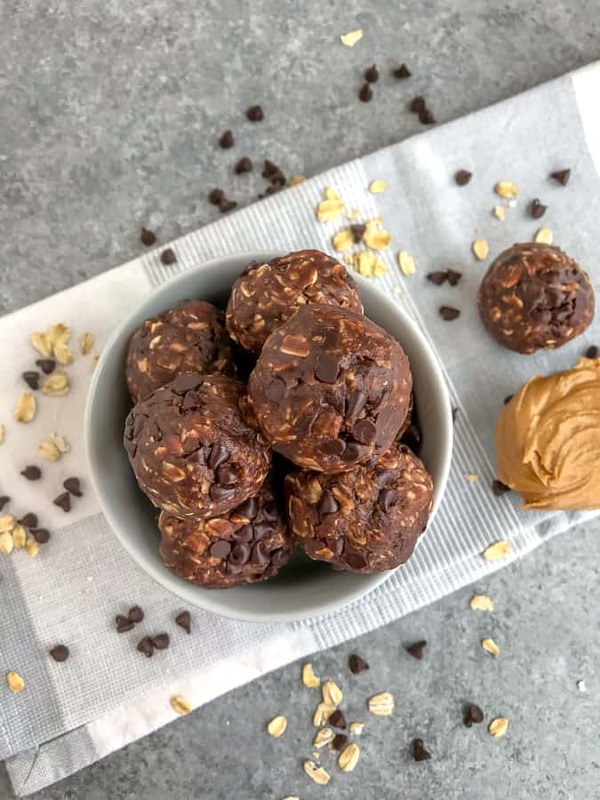 Full of chocolate, peanut butter, and oats – they make for the perfect treat to curb your sweet tooth. Great for meal prepping, make-ahead snacks, and for grab-n-go lifestyles. These are also kid-friendly! You read that right. Double chocolate. Peanut butter. Two of the best things created that come together deliciously! If there is one thing I love most – it’s peanut butter. 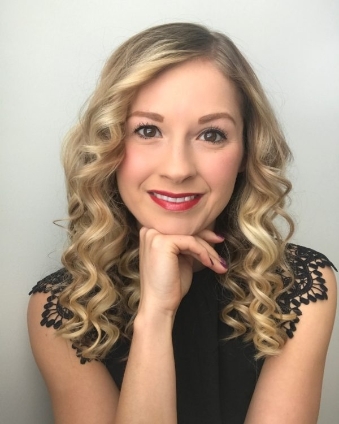 I may even love it more than my husband… kidding! Maybe. 😉 Combine it with chocolate? I’m floored and in heaven! So if you’re a chocolate lover, as well as a peanut butter fan – then you’re in the right place. 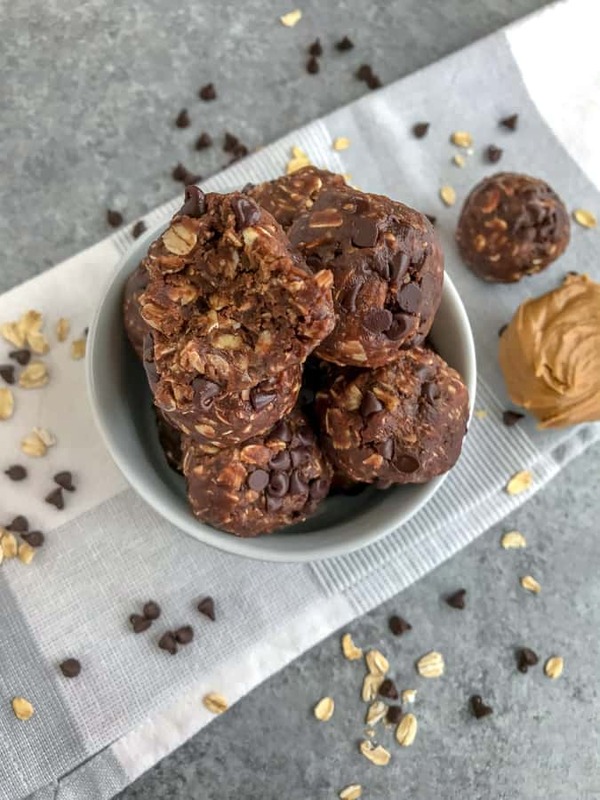 These bites come together in the food processor in under 10 minutes and make for the best, healthy treat for those late night cravings. We all have them – it’s ok. Combine all ingredients, minus the chocolate chips, into a food processor and process until fully mixed and thickened. 2-3 minutes. Cover and place into the refrigerator to thicken, if needed. 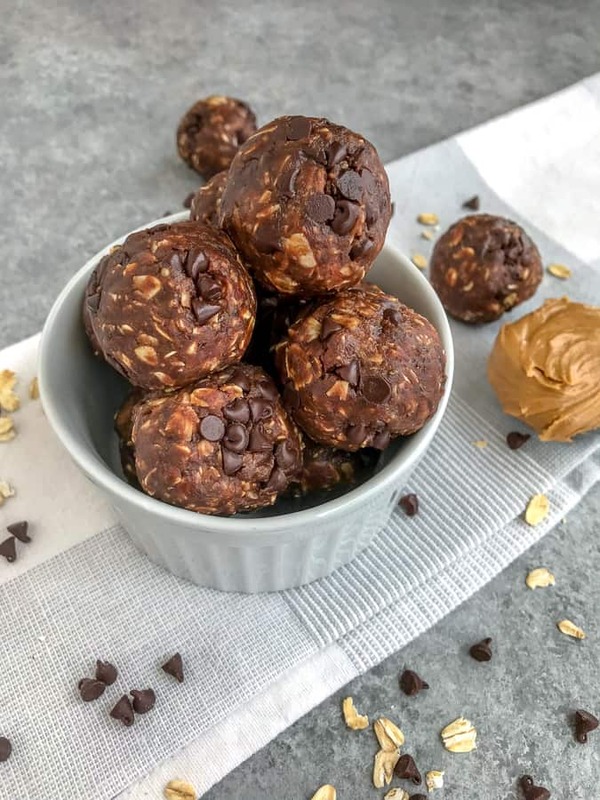 Using a 2-tablespoon cookie scoop, roll out 15-16 balls. To a small plate, add the chocolate chips. Roll the balls in the mixture. If they are not sticking, press lightly on 4 sides and re-roll. Store in an airtight container in the refrigerator for up to 1 week or in a freezer-safe container or bag for up to 1 month. Cookie Scoop – makes rolling so much easier, as well as portions the bites out correctly. Parchment Paper Sheets – great for storing these in the fridge or freezer in layers. Helps to keep them from sticking together. Glass Food Storage Container – store them in here in the refrigerator or freezer. Food Processor – works amazingly! Using a cookie scoop helps to portion out, as well as start the rolling process easier than using a spoon! Store in the fridge or freezer when not indulging. If the mixture seems dry, add 1-2 tablespoons of additional honey or peanut butter. If the mixture seems to wet, add a little extra oatmeal. 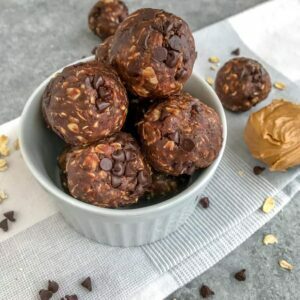 LOOKING FOR MORE BITES TO TRY? GOT A SWEET TOOTH? TRY THESE! 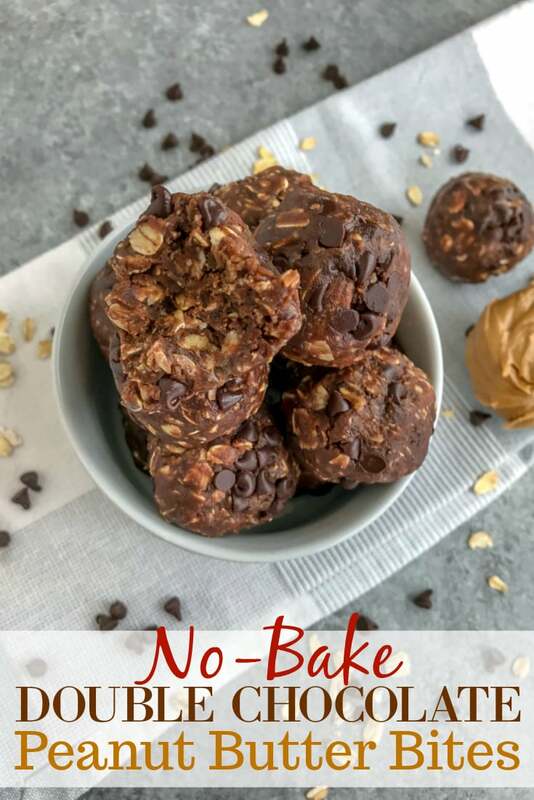 Easy and quick to make protein bites that are great for meal prep, are kid-friendly, and great for grabbing on the go! If you love chocolate and peanut butter, then this is the treat for you. If the mixture seems dry, add 1-2 tablespoons of honey or peanut butter. If it seems to be too dry, add a little extra oatmeal. The balls should be firm and chewy, as well as a little sticky.